I totally forgot my birthday today here in Cincinnati, but some friends did not. 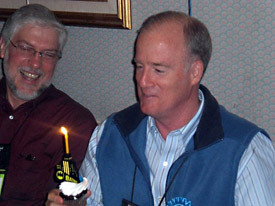 With today’s United Church of God General Conference of Elders meeting taking place, I completely forgot my birthday. However, Jesmina Allaoua in Germany tipped off a mutual friend here in Cincinnati that today is my birthday. I did not think anything was unusual when my wife Monica and Lisa Fenchel told me this afternoon that they would need to miss an hour of the afternoon meeting because they needed to do some shopping. We had the Q&A session after the regular meeting had ended, and then I had planned to go to dinner with some friends. When I arrived at the restaurant, I could see that there were balloons dangling from the chairs and all of a sudden everyone started blowing noisemakers and wishing me a happy birthday. I even got a cupcake with a symbolic candle to blow out. What a surprise!